Instead of sailing 44 miles straight to Vista Mar Marina, we decided to stop at Isla Otoque. 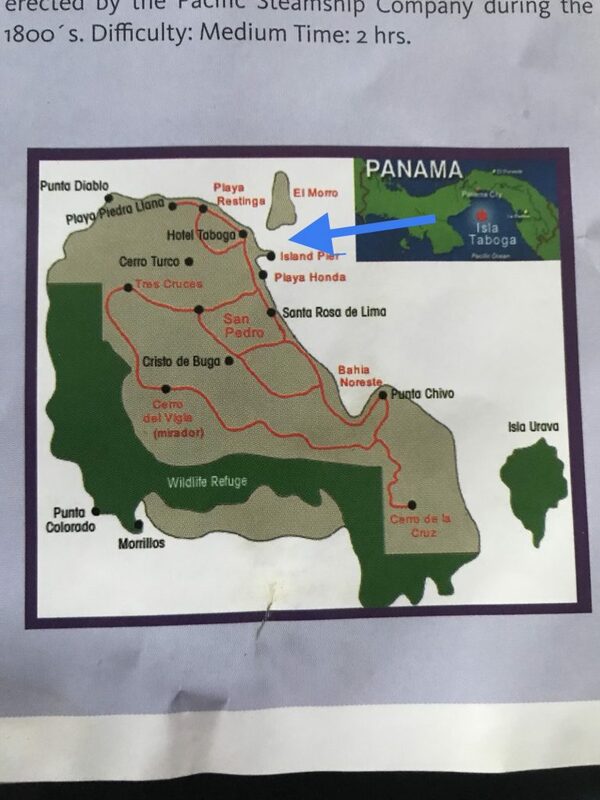 This island is about 20 miles from La Playita and has two villages Otoque Occidente and Otoque Oriente. Just a mile away from Isla Otoque is a very, very small island called Isla Bona which used to have an industrial operation in the past, but only remenants of heavy equipment are left behind. It was a fairly quick motor over to Isla Otoque as there was no wind. We swung into Isla Bona first as it looked really pretty in our guide book. However, the wind and current direction made for a bad swell so we decided to head back to Isla Otoque. There was one fishing boat, close to shore at the entrance. It was a huge bay, so we selected a spot closer to shore and on the opposite side of the bay. There is not much on the island other than old, broken down equipment that we could see from shore. We hung out on the boat, had a great rice bowl dinner with chicken, rice, corn, diced toms, chipotle peppers, black beans and cilantro – YUM! 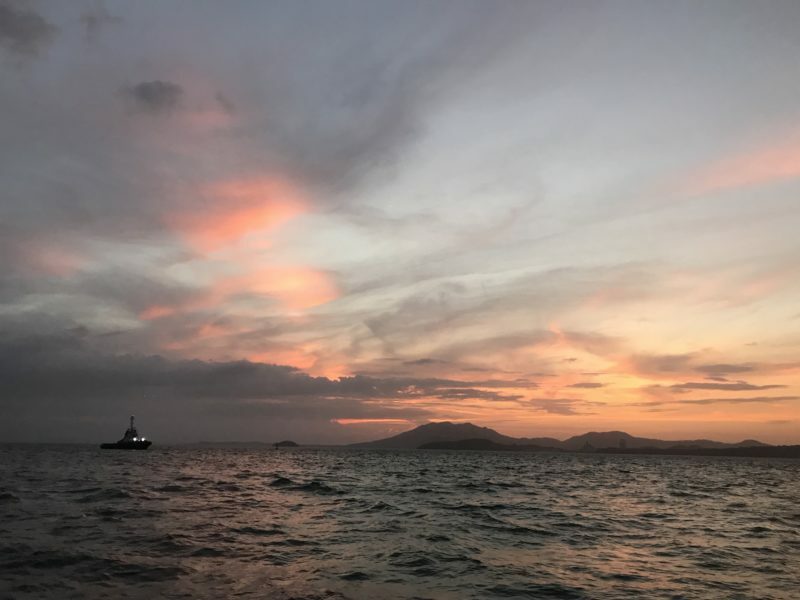 In the morning, we headed to Vista Mar Marina where we are to drop off our old batteries and meet up with “Itchy Foot.” It is 22 miles from Isla Otoque to Vista Mar Marina, and to our great surprise, it was a perfect beam reach. We were thrilled to unfurl our jib and hoist our main. 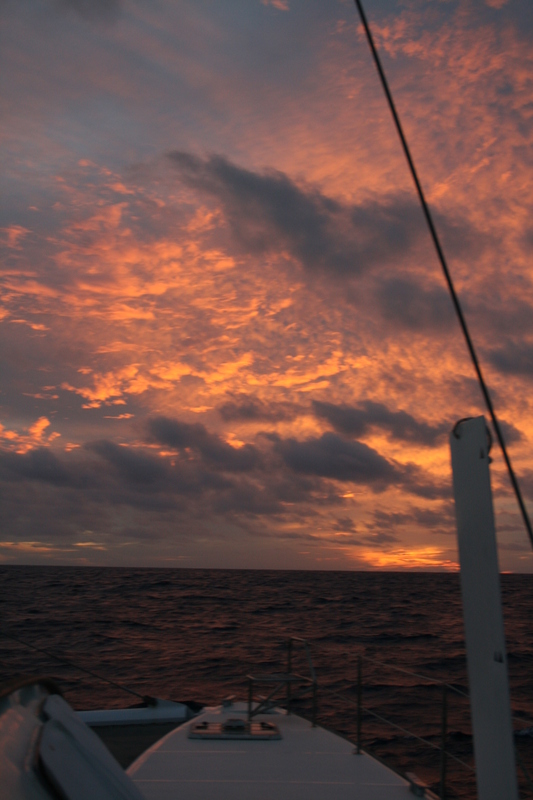 Just enough wind to keep us going at a steady 7 knots with an occasional 8 or 9 knots. 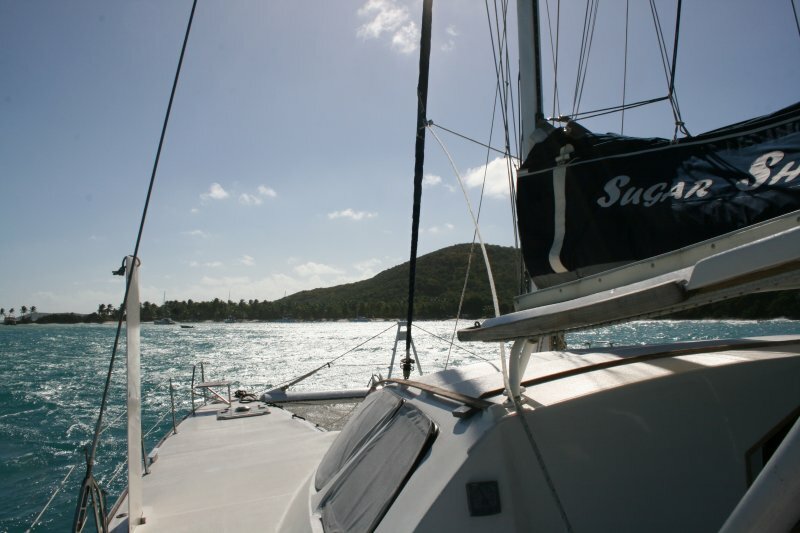 There is nothing like the feeling of sailing in perfect conditions. The sun on our back, the wind on our face, and the beautiful sound of the ocean lapping around us. We arrived too quickly for our liking as we were having fun – 3.5 hours. We were tempted to turn around and do it again, but alas we had things to do. The water drops to about 9 meters about 3 miles from the breakwater. As you get closer it drops to 4 meters. Very strange. We decided to fuel up first, so the marina met us at the fuel dock. Pretty painless and fairly reasonable at $3 per gallon. (about $.20 cheaper than La Playita). After we pulled into a slip, secured the boat, and said hello to Jon and Mia, I headed to the office. We only decided to pay for a slip because it is really inexpensive. We thought about anchoring outside, but having access to free water, wifi, and electricity was too good to pass up. It turned out to be $25 per night ($.50/foot). Keep in mind that we normally pay $2-$2.50 per foot plus an additional 50% because we are a double wide. So, this is really cheap. 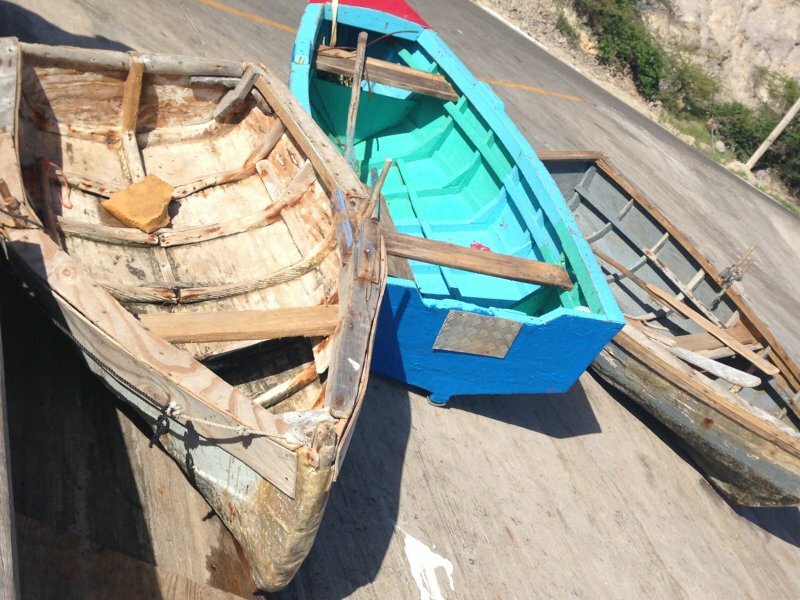 They are trying to attract more boats to their marina, since they are new. With rates likes this it is hard to say “no.” We know of 4 other boats here: Itchy Foot, Freya (from San Blas Islands), Iris, and Kefe. We headed to the pool to cool off and have a beer with Jon, Mia and Teo (Itchy Foot) and enjoyed a nice sunset. 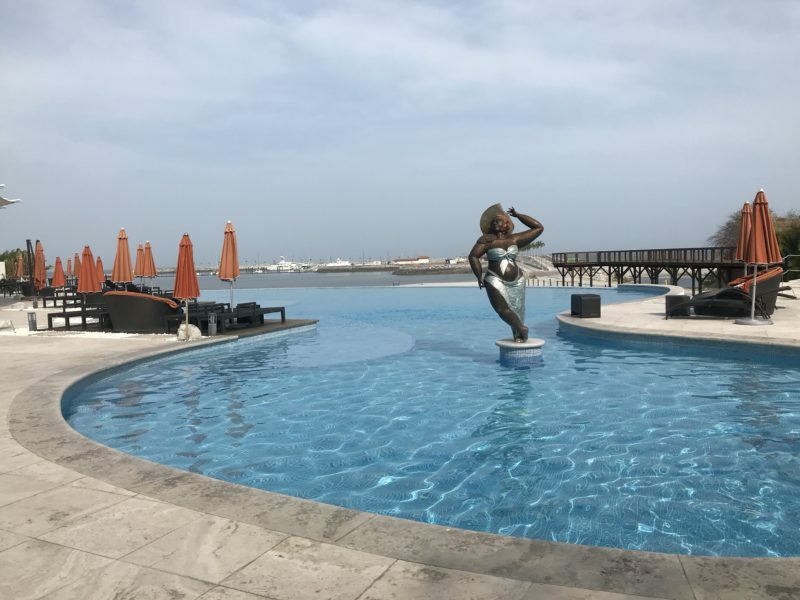 The top pool is about 2′-4′ and has a nice negative edge overlooking the marina. The bottom pool / jacuzzi is RED which looks like a pool full of blood in the photo, but in real life it is actually interestingly pretty. 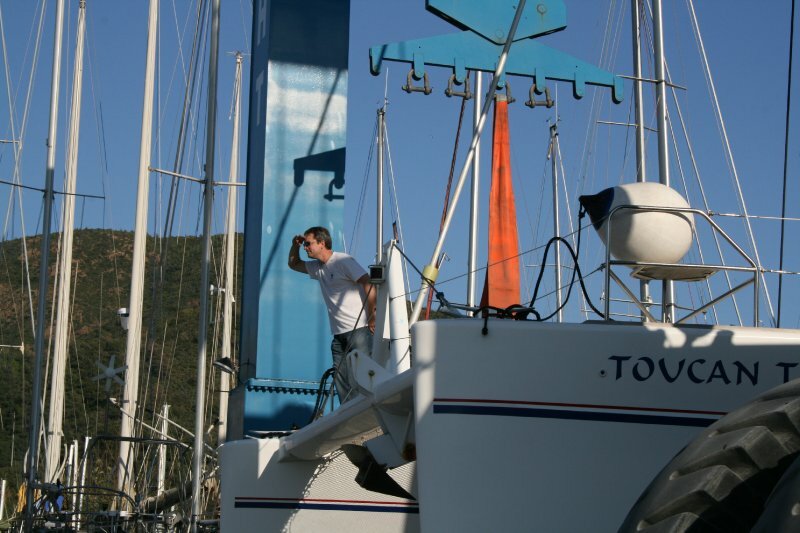 Matt took this opportunity to wash down the boat with the pressure washer and fresh water. He also swapped out our old batteries with the new which was no easy task. Trying to manuever 90lb blocks within the settee proved to be a challenge, but he got the job done and they are working like a charm! IMAGE: Top photo is of the old battery bank. 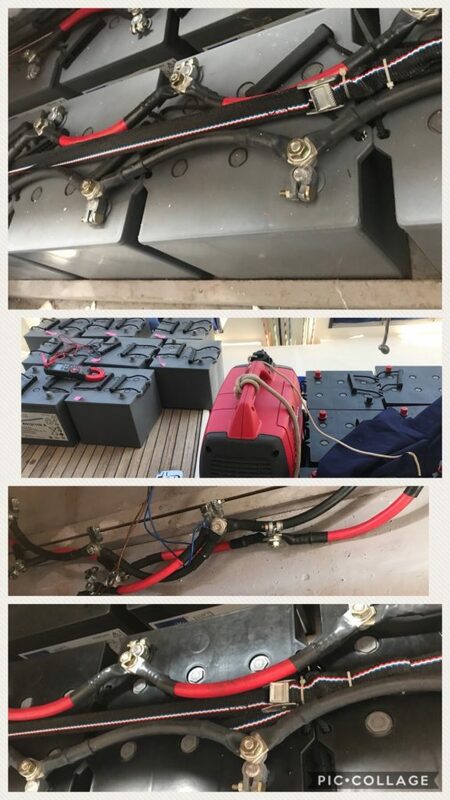 Middle photo is the old batteries (gray), with the honda generator and the new batteries (black). Bottom is the new battery bank installed and working. 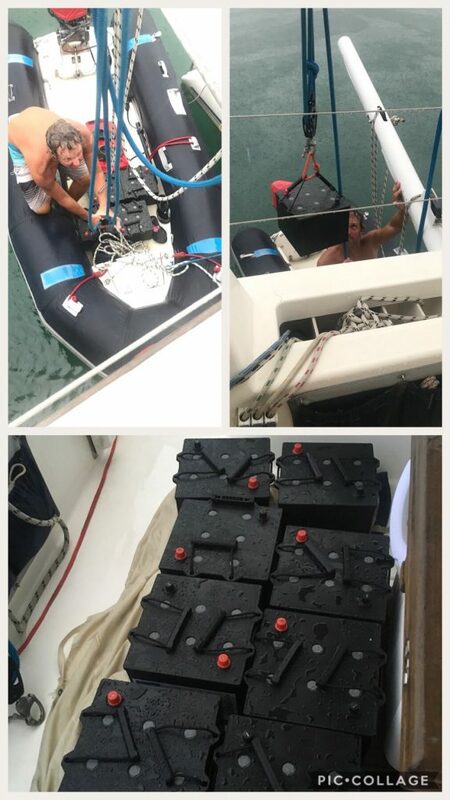 We dropped off two of our older batteries to “White Shadow” (Barry is visiting friends in London), and the marina took care of disposing the other 5 batteries. We kept one for emergencies. The marina also took away our old window coverings that had yellowed and ceased being “presentable” and old defunct honda generator. We finished cleaning and putting oil on our teak sugar scoops and they look lovely, finished our fruit, helped “Itchy Foot” with their rigging, cleaned up the boat, more noodling and pool time. Sugar Scoops cleaned up with a new coat of teak oil. A group of us went to dinner at the local restaurant called “Boga Bar” with Jon, Mia (Itchy Foot), Johana, Timlo (Iiris), and John, Becca. Not my favorite place, the food was average to poor and it was pricey, but the company was first class. 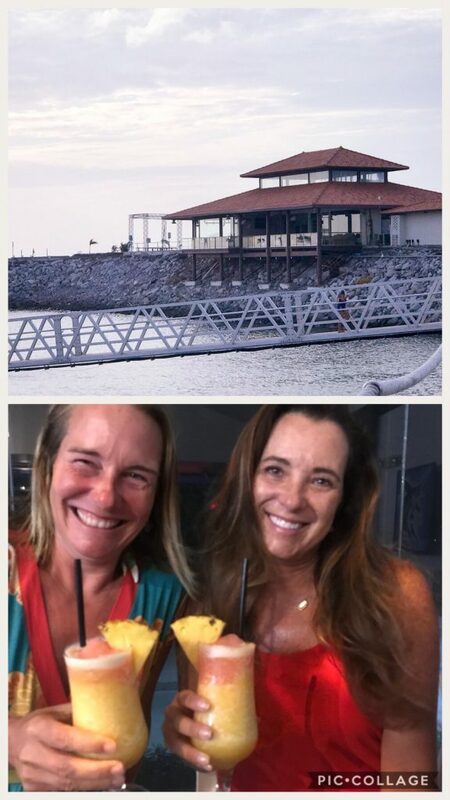 Top image is the bar and bottom image is Mia and I having a tasty cocktail. Boga Bar dinner with good friends. 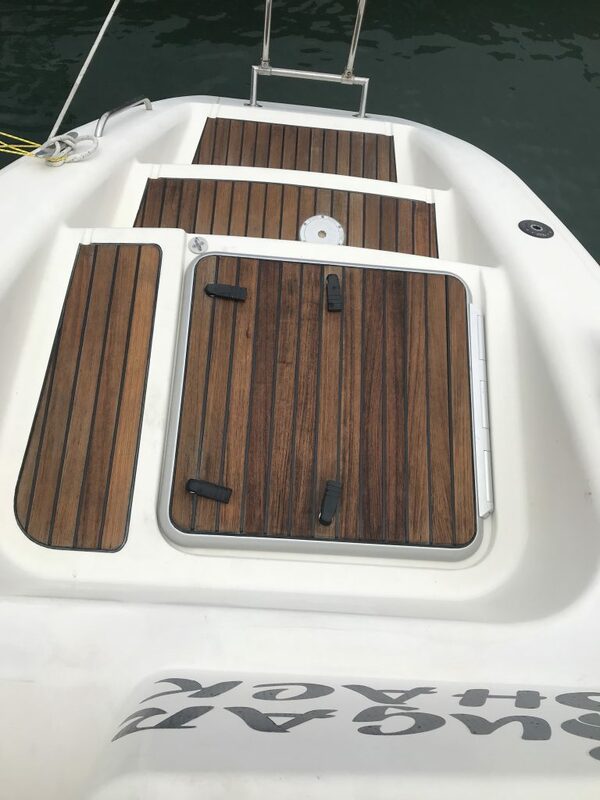 This entry was posted in Panama Pacific and tagged AGM A512 batteries, Boga Bar, catamaran, catana, isla bona, isla Otoque, living on a boat, noodling at sea, panama, sailing, sugar shack, vista mar marina on May 31, 2018 by Christine. 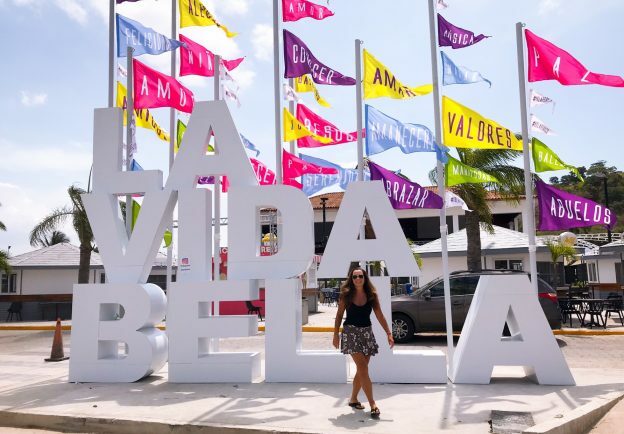 Our second stay at La Playita was meant to be a productive one with lots of errands and chores. We made a plan for each day, then remade the plans each night. After all, plans were meant to change, right? We arrived Thursday by mid-afternoon to receive our batteries. Our hope was to get the batteries, load them on to the dinghy at high tide, and get them on to the boat. Then either do laundry or squeeze in a quick trip to the marine store. Our shipper, Coray from MailBoxes Etc. sent a text that he had picked up the customs agent and they were on their way to get the pallet of batteries. Sweet! We jumped in Sweetie and texted him that we were at the dock at 1145. Little miscommunication, they still had to load the batteries and would be at our dock in 30 minutes. 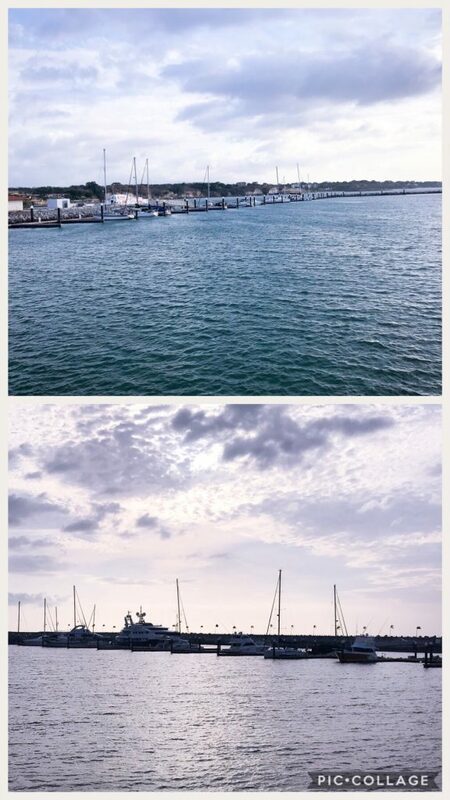 I’ll spare you the boring details, but it took Coray 2 trips to La Flamencio marina to meet with another customs agent there, 2 trips to the Balboa Yacht Club to meet with a different customs agent, and 4 trips to us before he could finally unload the batteries. 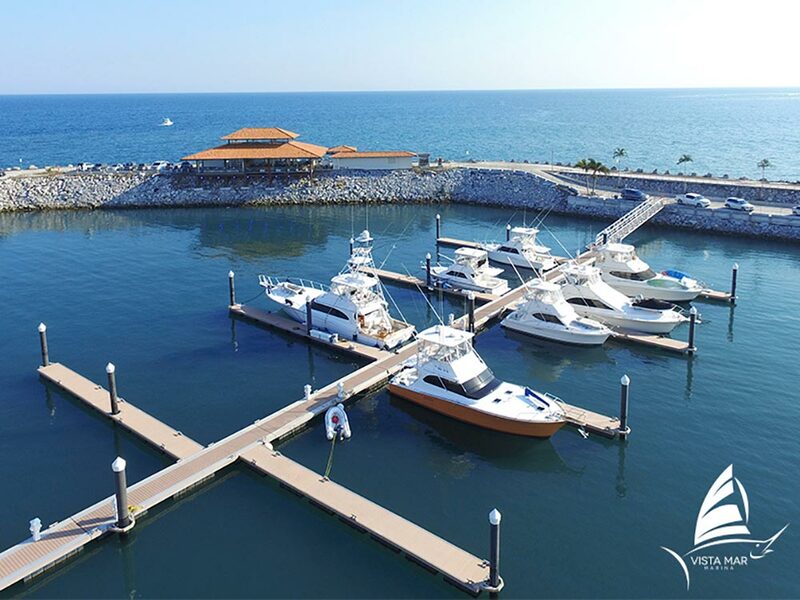 Evidently, the invoice stated Amador Yacht Club as the delivery location as opposed to La Playita Marina. That small error was causing all sorts of problems, but Coray got it done, albeit 5.5 hours later. At this point, it was low tide and raining. Yep, raining. It is dry season and has not rained in over 3 months. But, the day our batteries are delivered it poured. Matt loaded each battery, one at a time on to our dolly, and slowly walked them down the very steep and slippery ramp to the dinghy dock. I’m not sure how he did it, but they all made it safely into the dinghy. Luckily for us, the dinghy is rated for 1200 lbs. With the batteries, Matt and I, we were pushing 1100 lbs. But, the extra water from the rain probably added another 20-30 lbs. We slowly made our way to the big boat where Matt rigged a pulley system. He was in the dinghy while I was on the big boat. As he hoisted the battery up, at a 3 to 1 ratio, I pulled it in once it was above the life line. Then he lowered it to the deck as I guided it into place. IMAGE: If you look closely you can see the rain drops on the water. A soaked Matt prepares battery #5 for hoisting on deck and then all 8 batteries on board Sugar Shack. What does it take to deliver a pallet of (8) batteries from the U.S. to Panama? It takes 16 documents, 29 stamps, 1 vender, 2 shippers and lots of patience. 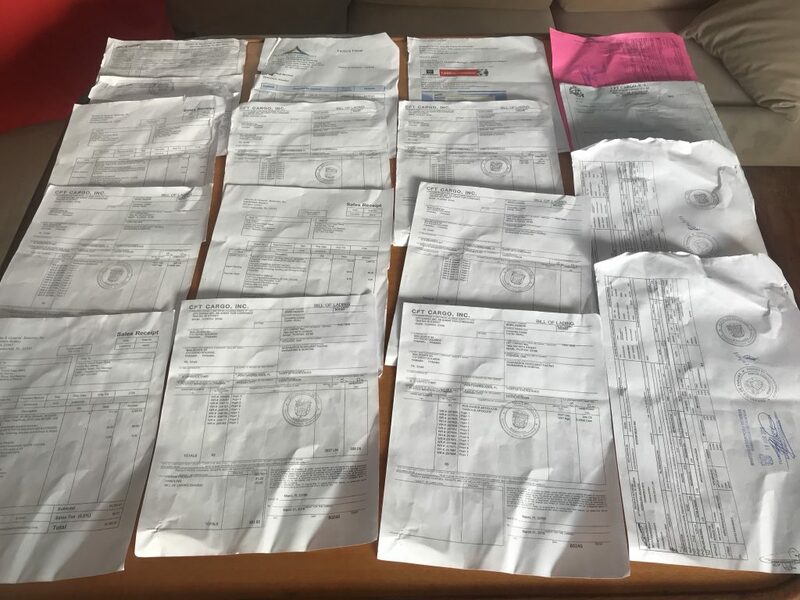 Battery paperwork, 16 docs & 29 stamps. They are on the boat. But the day was shot as we waited at the marina office all day so as not to miss him. No laundry, no errands. Re-plan, re-schedule. The next day, I got up early to use the awesome washer/dryer units. I had been bragging on how efficient these are to everyone and of course, this last time they sucked. Normally, the washers take 28 minutes, but for some reason, they took 52 minutes (at $2 for each machine). The dryers, normally take 42 minutes, but after the first run, everything was still damp. CRAP! Put $2 in each machine and start over. After 2.5 hours of trying to dry my clothes I realize that the gas must be off as there is no heat coming out of either dryer. 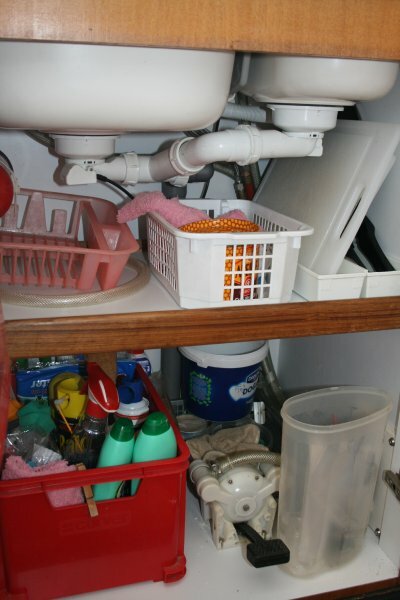 I gathered my wet laundry, alerted the office of the problem, and went back to the boat to hang 4 loads of laundry. The perfect white trash vessel. That took way longer than expected, so we changed our plans again. We decided to take a taxi cab to the health clinic, as opposed to the bus. We need to get a Yellow Fever vaccine in order to get into Costa Rica, Ecuador, and Peru. Not a problem, a fellow cruiser told us where to go and what to do. We grab a cab and hurry to the facility as they close at 1400 (it was 1230p). We waited for 5 people to pay the cashier before heading to the nurse. 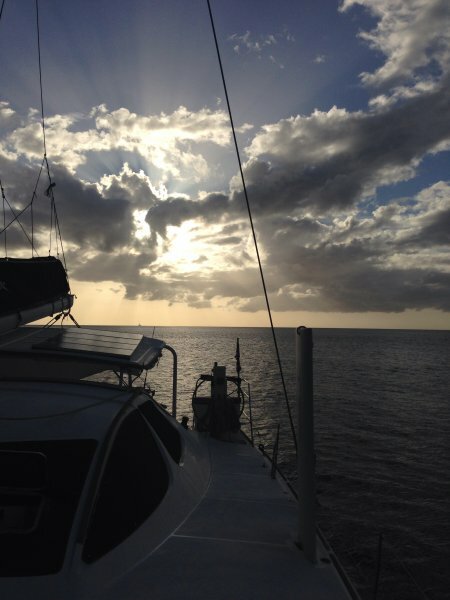 When it was our turn, we dutifully hand over our boat paperwork and passports. She looks at me, then stands up and says, “no.” She did not like my shorts and tank top and told us that we had to come back with long pants and a short/long sleeved top. CRAP. As we headed to our cab, the security guard asked why we were leaving so soon. We told him what happened, he rushes inside, and comes out with a pair of men’s pants. It would work for Matt, but I was stuck. We thanked him profusely and left. We had planned on leaving on Sunday, but now we have to come back on Monday to get the vaccine. Replain, now that we still had a taxi, we decided to at least do one of our errands. We hit Riba Smith, a super nice grocery store that has diet cranberry gingerale. My favorite. We grabbed 8 sleeves and headed back to the boat in time for Friday night happy hour. The next day, we did some computer work (digital paperwork). We had to do return our damaged wind vang and broken Henckel knife, find a hotel for Matt’s mom who wants to visit us in Costa Rica, pay bills, and do our taxes. 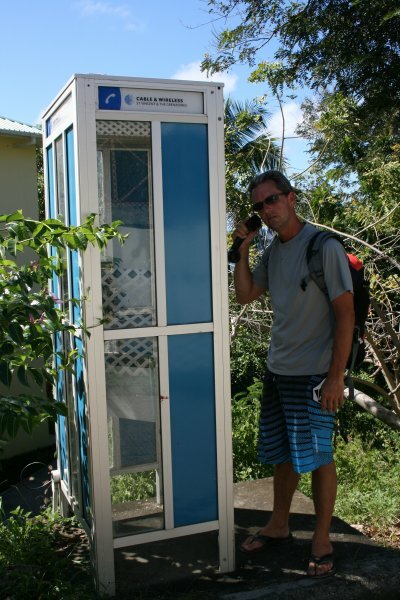 After a few hours, we headed to town for more provisioning. We hopped on the bus to Allbrook Mall, then hopped on another bus that dropped us off right in front of the marine store. This entry was posted in Panama Pacific and tagged abernathy's, allbrook mall, car fashion, catamaran, catana, Feria de la City, Iglesia Nuestra Sra. 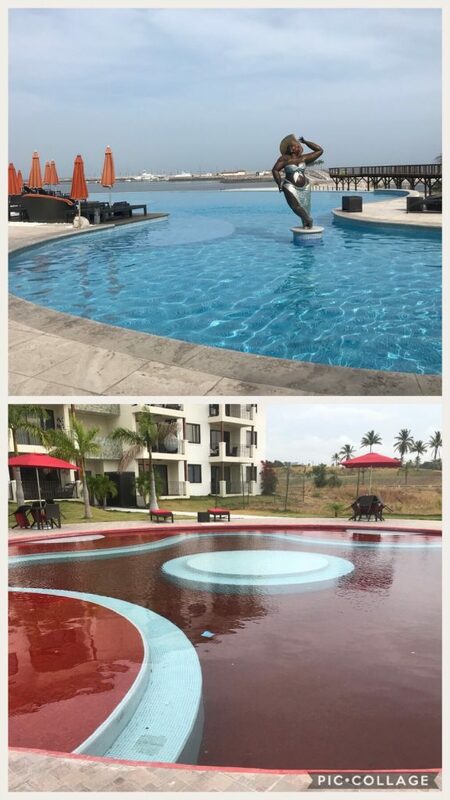 Del Carmen, la flamenco, la mark, living on a boat, mailboxes etc., mega depot, panama, riba smith, sailing, Una Mas, yellow fever shots on May 29, 2018 by Christine. 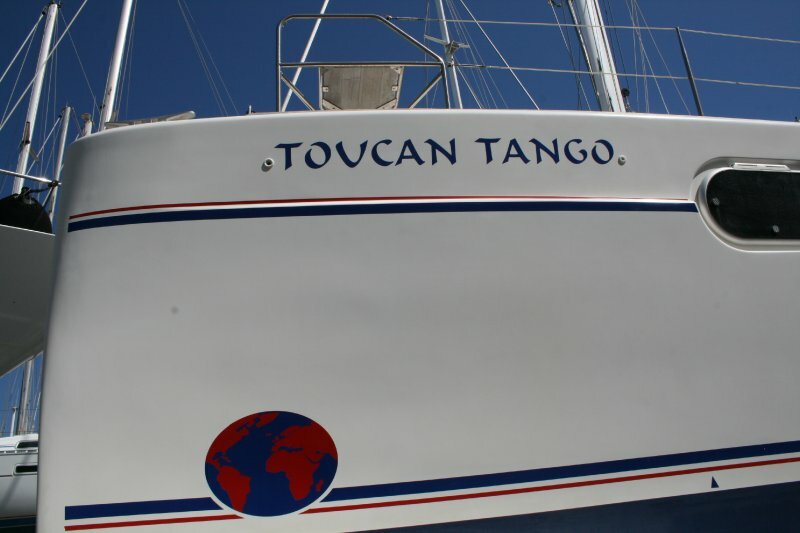 Located 7-miles off the coast of Panama are the Taboga islands. Isla Tabogo was called “Island of Flowers” when it was under Spanish rule. They used this island as a base from which to loot the riches of Peru and the South American Continent. Later, it became a notorious pirate hideout. But in 1840, the island became the headquarters for the Pacific Steamship Navigation Company. Then during the French Panama Canal construction, a hospital and sanitarium were built and the island was used to to treat workers with yellow fever. Today, the island is a wildlife refuge across its 8km perimeter. 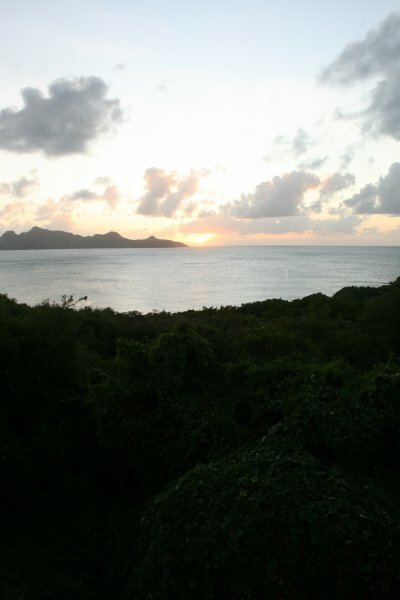 There are several hiking trails around both islands but unfortunately there is no easy way to get to shore. 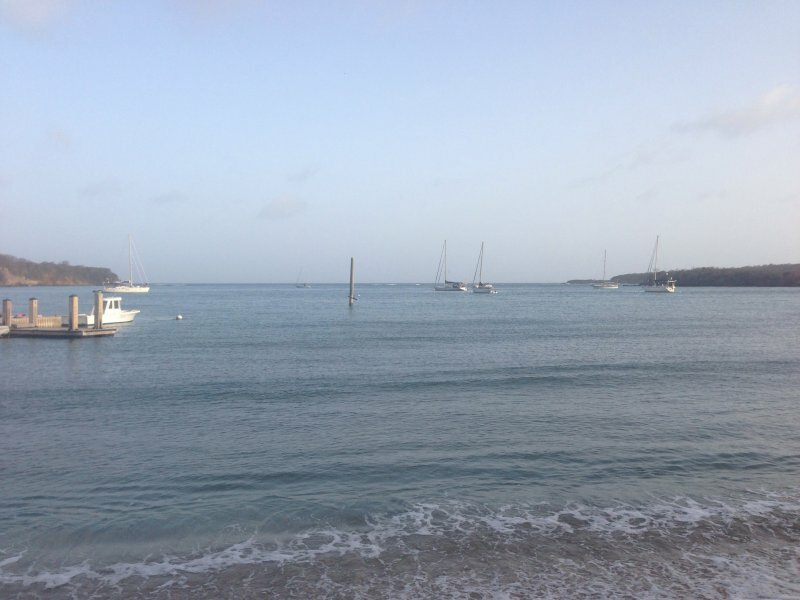 There is one good anchorage between Isla Tabogo and El Morro which is supposed to be protected. Arrow below points to the anchorage. 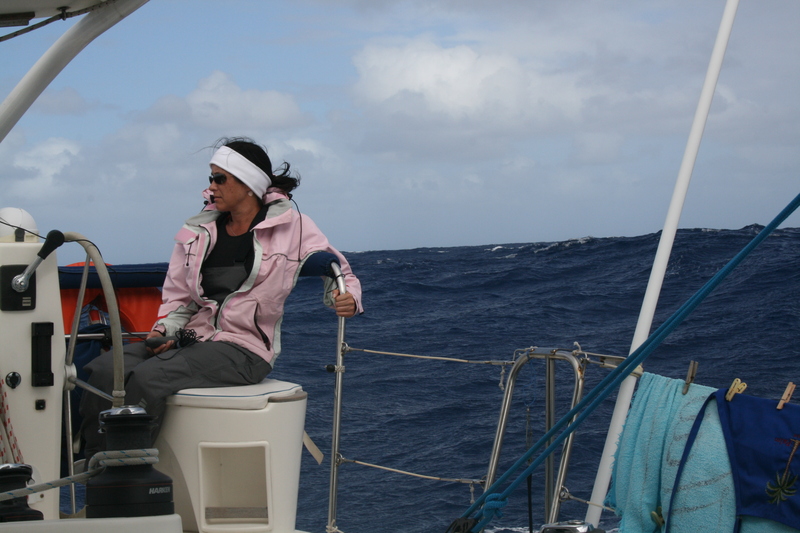 We arrived in the middle of the afternoon and decided to watch the wind, waves, and current before going ashore. 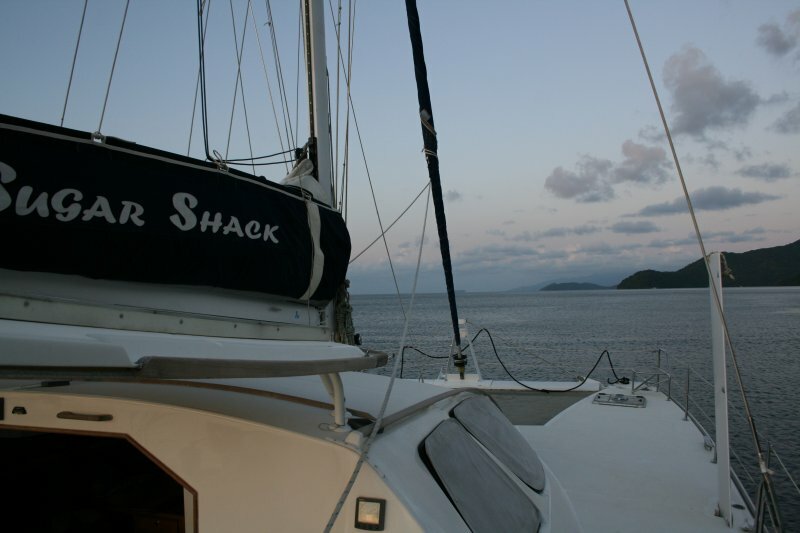 The anchorage is full of commercial moorings and one large commercial dock that brings lots of traffic. Finding an anchor spot was challenging as we did not want to be too close to a mooring. We found what we thought was a good spot and endured the small incoming rolls. 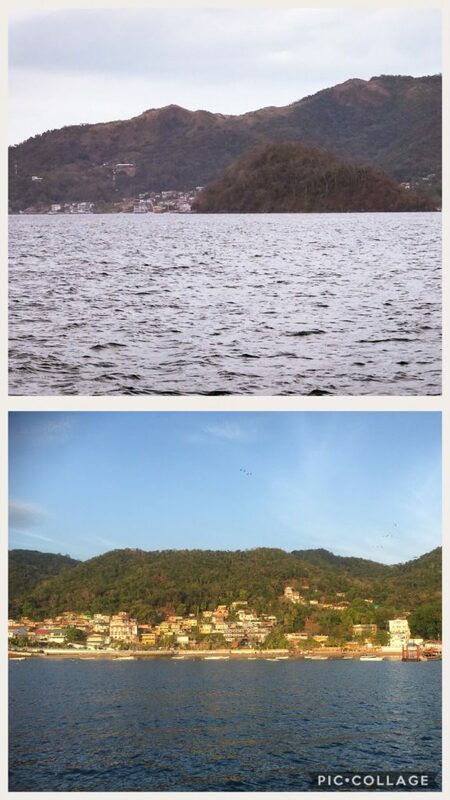 IMAGE: Isla Taboga behind El Morro and below is the town at Isla Tabogo with the sun illuminating it. The tide varied by 5 meters (yep, 15′) so we put out enough scope to cover high tide. This entry was posted in Panama Pacific and tagged auseel auto repair, catamaran, catana, el morro, isla tabogo, la palyita, living on a boat, living the dream, panama, sailing, sugar shack, sunset on May 24, 2018 by Christine.